The research work was initiated on the jaggery preparation from sugarcane juice in the year 1976 –77 to solve the problems of jaggery making and to standardise the method of jaggery making. On the basis of previous research work an Ad-hoc scheme was sanctioned during thre year 1989- 90 by ICAR, New Delhi for Preparation and storage techniqes in jaggery .After successfully completion of research secheme the findings on preparation of jaggery ( standardization for pH, temperature and clarificants ) and storage techniques of jaggery blocks were made for improving the jaggery quality. In addition to the regular teaching programme, the teachers are also conducting research on the problems faced by the farmers and feed back received from different Agril. Extension agencies. So far this department has planned to initiate the research activity on silicon nutrition to Paddy . 20,000 soil samples were analysed for different parameters and fertilizer recommendation were given to the farmers through RAWE since 1990 . The silent features of resarch carried out by this section are as under. The yield and oil content of sunflower was found significantly increased with increasing dose of phosphorus and sulphur. A saving in the cost of fertiliser to upland rice could be possible by applying rock phosphate after mixing with FYM instead of single super phosphate. Soil compaction after sowing of rice was found beneficial in increasing the grain yield of different rice cultivars. Foliar application of boron @ 0.1 ppm at the age of 35 and 55 days of crop growth of groundnut was found beneficial to increase the dry pod yield in the range 1.29 to 23.06 per cent in different cultivars. The demonstration trials conducted in sangli and satara district on Zn deficient soils indicated that application of Zinc @ 20 kg ha-1 to wheat crop was found beneficial to increase wheat grain yield from 5 to 20 per cent. Application of boron @ 5 kg ha-1 through borax once in 1, 2 and 3 years has not resulted in increasing the dry pod yield of kharif groundnut. Miss. Borate S.R. Dr. R.V. 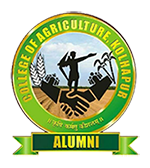 Kulkarni Studies on morphological and chemical properties of the soils of Agriculture college farm, Kolhapur. Miss. Patil S.S. Dr. D.S. Patil Studies on soil morphological, physical and chemical properties of important soil series of Kolhapur District. Wader S.B. Dr. R.B. Pawar Effect of different level of silicon on growth, nutrient uptake and yield of upland Paddy in an Inceptisol. Miss. Arekar S. A. Dr. R.B.Pawar Effect of sources and levels of silicon on yield of paddy. Pathak K. K. Dr. R.V.Kulkarni Studies on physical properties of soils of Agriculture College Farm, Kolhapur. Narendra Singh Shekhawat Dr. B.S.Kadam Studies on characterization of representative soil profile from different research stations of sub montane zone of Maharashtra. Shelake S. A. Dr. A.L.Pharande Studies on potassium behaviour in important soil series of Kolhapur district. Shinde N. B. Dr.D.S.Patil Vertical distribution of different forms of phosphorous & phosphorous supplying capacity of important soil series of Kolhapur district. Shinde S. P. Prof. S.M. Jagtap Characterization and classification of underground irrigation water of Karveer tahasil, District Kolhapur.